At 12,000 feet in mid-July along Rocky Mountain National Park’s Trail Ridge Road, an elk enjoys a lazy summer evening. I was hoping this amazing creature was sit still until the sun hit the horizon, and for 20 minutes he sayed put. Finally, I captured the moment I wanted. As if on cue, as I was packing up my tripod, camera and lenses, he stood and strolled down the gentle slope and into the evening. 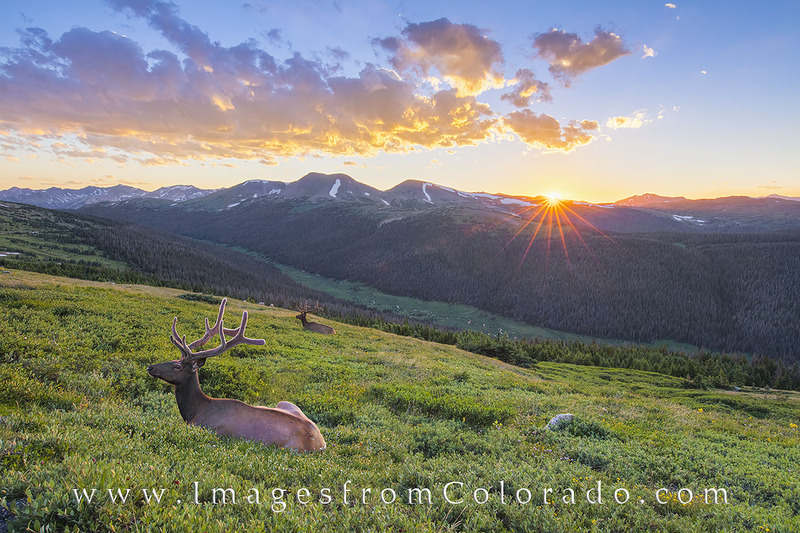 Elk enjoy a lazy summer sunset in Colorado's Rocky Mountain National Park. This photograph was taken in mid July at about 12,000 feet as the sun set in the west over the Rocky Mountains. The elk in the foreground sat there for 20 minutes, allowing me to photograph him from several angles. When I packed my camera and lenses, he stood up and strolled away. Photo © copyright by Rob Greebon.